- Presents labor relations as a system for balancing employment relationship goals (efficiency, equity, and voice) and the rights of labor and management. 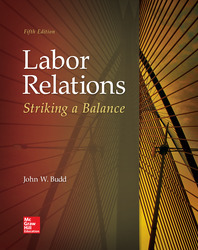 - By weaving these themes alongside the importance of alternative perspectives, students can learn how the traditional labor relations processes work, why these processes exist and how to evaluate if they are working. Chapter 2: Labor Unions: Good or Bad? Chapter 13: What Should Labor Relations Do?